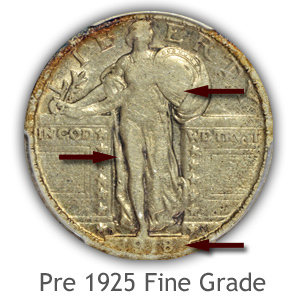 Inspect and judge the key elements of the surface of the coin, compare to the images, video and descriptions to begin grading Standing Liberty quarters. All of these quarters in Fine grade and above are worth in excess of silver bullion value. 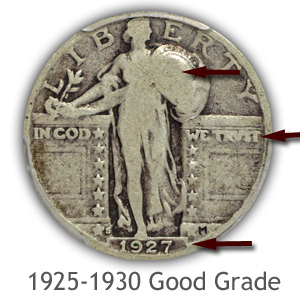 Further study of accurately judging a very worn date on the coin is found below the grading images. 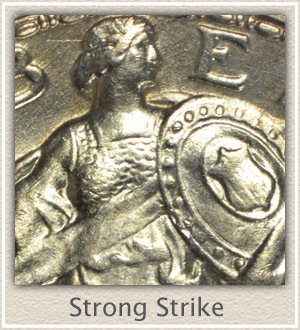 Additionally Standing Liberty quarters are known for their often soft striking of the design details. How this impacts the grade is also found below. Begin the grading process by closely examining your coins. Overall appearance and evidence of sharp crisp details indicates a higher grade. In the Standing Liberty quarter series extra time judging the condition of these coins is necessary. Key factors deciding on grade are highlighted in the video, descriptions describe the points to consider and the images display locations on the coin to inspect. Starting with the finest condition coin you have is a good method. These high condition coins show the greatest amount of detail, and later, when grading lower condition coins, recognition of the amount of wear becomes evident. An Uncirculated grade Standing Liberty quarter is one that is in the condition it left the mint. Important to the grade is the surface is free of wear. Mint luster is undisturbed and intact. Because of the appeal of these coins they are high on want lists of collectors. Identify the absence of wear by inspecting the prominent areas prone to first contact. Using a single light source and rotating the coin while tilting allows the light to bounce off the surface highlighting the grain of the luster. Liberty's right knee is high in profile and the first point to show signs of contact and dulling from wear. Inspect closely and confirm the area is lustrous and with original texture. Inspect the folds in the dress along the mid-section of Liberty. Additionally, judge the fabric covering the lower part of the shield. Circulation and friction dulls the surface and is an indication of wear. The Center of Shield is also raised and subject to early wear. With a close up view verify mint luster is present and no smoothing has occurred. Note: expect a certain amount of weakness in the strike along the edge of the shield at Liberty's body. The area should remain without dulling. In the lower right of Liberty's gown are high profile folds, each must not display any signs of wear. First to judge on the revers is the leading edge of the Eagle's right wing. It is here flatness first appears when circulation wear is evident. A rounded profile and texture of luster needs to remain. 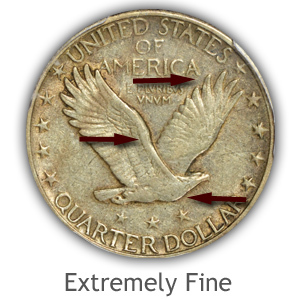 Eagle's chest area, if slight wear is present an off color look compared to the rest of the coin is displayed. Often the fine feather separation and detail is missing to the chest due to striking softness, this does not indicate wear. Off color and smoothness is the indicator of wear. Left wing just above the head of the Eagle. Full luster and texture covers a mint state coin. Helping identify the mint state grade; hold the coin at steep angle to a single light source, high points are easier to identify and judge. Tail feathers must show lines separating each without any signs of loss of luster and texture. Very ending edges of all feathers remain with a rounded profile. Any wear to these surfaces shows as small flat spots. In the Extremely Fine grade evidence of wear is beginning to show on select areas of the surface. Importantly wear is very light, not widespread and the flatness caused is minimal. A Standing Liberty quarter in this grade gives the appearance of crisp and sharp details. Extremely Fine is a true collector grade and many dates and mints are sought as part of collections. Liberty's right leg has a narrow worn area extending just above the knee and down to the foot. This flatness is limited to just the uppermost contour of the leg. Folds in the gown crossing the left thigh show only minor flatness as well as the folds to the side. No merging of fine detail is occurring only small unconnected areas of flatness. Fabric covering the bottom of the shield is flattened to a small degree with the major fold lines bold. In the extremely fine grade the lower shield area remains well defined. Scarf crossing Liberty's body shows only minor smoothing, with the top edge of the scarf complete as it crosses Liberty. Evidence of wear is just beginning to flatten the scarf in Liberty's right hand near the olive branch. Front edge of the right wing is flattened along the length extending to the eagle. However the flatness is narrow and only slightly reduces the roundness and contour of the edge. Feathers on the lower portion of eagle's breast are just beginning to merge or missing on many Extremely Fine examples. Even a small trace of wear causes smoothness in this area. The area must retain a roundness and no flatness. Wear is confined to only the outer edges of the larger feathers of the both wings. The area of the left wing just above the Eagle's head is beginning to appear smooth and a loss of fine details in a small area. Fine details separating the feathers on both wings remain bold and distinct. Overall the wings and feathers retain a crisp appearance. 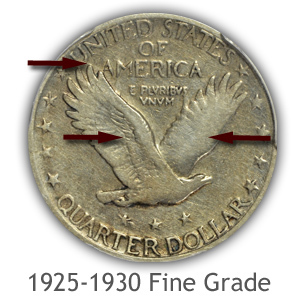 Judging the condition of a well-worn Standing Liberty quarters now must take into consideration the boldness of the date and surrounding area. 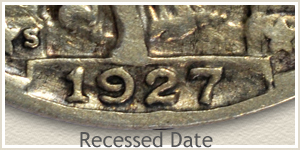 Coins struck prior to 1925 positioned the date in high profile on the step detail. Causing wear to diminish and fade the date quickly. The problem was resolved from 1925 onward by recessing the date. The rest of the coin is judged the same on both designs. 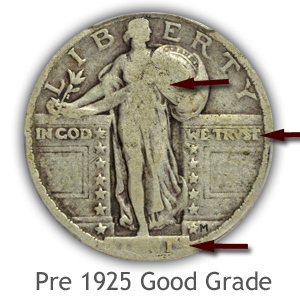 To reach the Fine grade a complete date on pre 1925 coins is fully readable… although faded and weak. 1925 through 1930 the date is well defined, fully readable and bold. Liberty's right leg is now one continuous flat plane extending from the hip to the foot. Flatness extends almost to the edges of the leg with very little edge contour. Center of Liberty is flat and merging with the scarf. Little to no top and bottom edge to the scarf is visible as it crosses Liberty. Liberty's gown over the left leg is showing areas of flatness in the folds. Fold crossing the left shin is just beginning to merge with the leg. Gown covering the lower part of the shield is still showing a separation from shield. Flat areas are visible, however very little merging of the major details. The leading edge of the right wing now displays a wide flatness from the tip to eagle. Fine feather detail and texture of the left wing is missing leaving only major detail separating the ends of the feathers. Some flatness is beginning to show along the front edge of the wing. Outer edges of the right wing are worn flat, however the central detail is well defined. Fine lines remain separating the feathers. Rim must be separate from the tops of the lettering and stars to reach the Fine grade. With moderate even wear, qualities of the Fine grade are intact on both reverses; pre 1925 and the 1925 through 1930 era. Majority of design detail lost in the Good grade is confined to Liberty herself. Heavy wear has diminished most of the fine lines of the gown and shield. With the lettering complete along the rim these Standing Liberty quarters still display a nice appearance. 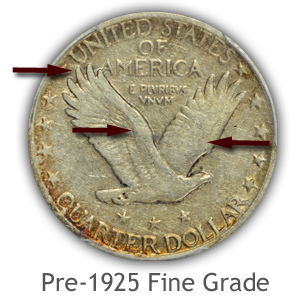 Determining the date is the important element to judging a coin in at least the Good grade. Pre 1925 coins must have at least one digit readable to confirm a date. Coins dated 1925 through 1930; a full date is necessary. Liberty is worn almost flat, roundness is found only along the edges of her profile. Right arm is distinct holding the olive branch. Major fold lines are visible to gown on left side and in the hip area, although very flattened. Letters of "Trust" often faded but remain legible. Merging of letters is minor. Rim is complete around entire edge. Letters are separated from the rim confirming the Good grade. Tops of letters are often faded but remain complete. Heavy wear has removed the contoured profile of the eagle, flatness covers all but the central area of the right wing. Rim has faded and merged into parts of the lettering and stars. Merging must be minor and confined to just the tops of the letters leaving lower parts clear. Parts of "E Pluribus Unum" are often weak and faded but must remain readable. Bold lettering adds to the appeal to these circulated quarters. By comparing your coins to the images an accurate judgement of grade is possible. 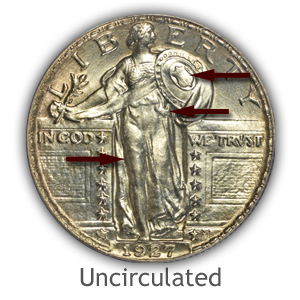 Circulated Standing Liberty quarters display recognizable wear patterns and distinctions from one grade to the next. A study of the key areas confirms the different grades. Every pre 1925 date is worth well above silver content value and every 1925 through 1930 quarter in Extremely Fine grade is very collectible and valued. 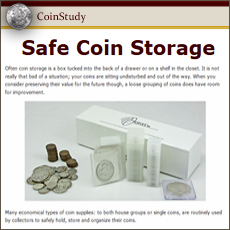 A couple of special situations are considered when judging condition of these coins. Firstly, two different designs of the date area were used, and the need to judging the difference. Secondly, there must be consideration given to the often found softly struck coin. 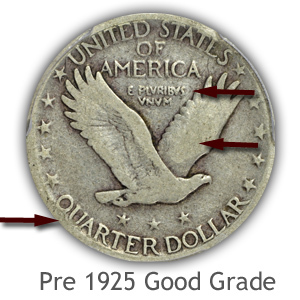 Placing a value on and grading a worn Standing Liberty quarter starts with the important date area and then moves to the rest of the design. The hope is a coin grading Good or better. 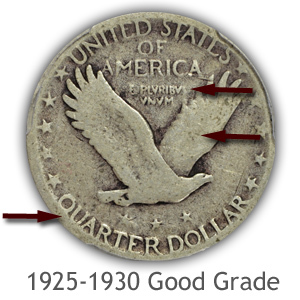 Detecting a faded date, one missing clear digits on 1925 through 1930 quarter is an indication of a lower than Good grade coin. 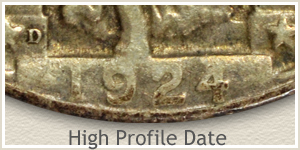 However, because of the design used in the date area on pre 1925 coins, finding faded numbers is normal with-in the Good grade. A flat step was used on the design displaying the date in the early years. With the date bold and high in profile in relation to the rest of the coin, it was first to show signs of wear and faded quickly. In 1925 a solution was reworked into the die and the date was recessed into the step. 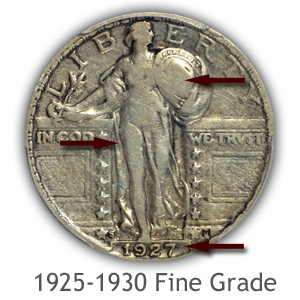 No longer high in profile and now protected; 1925 through 1930 coins display a clear date in the Good grade. One more important consideration is given to the quality of strike the coin displays. These quarters were often softly struck. Missing detail, when not fully struck, gives the coin a deceptive worn appearance. 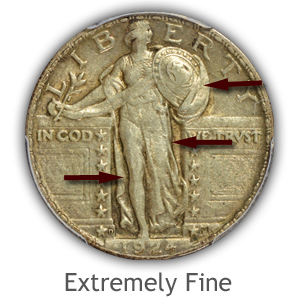 Comparing the two coins imaged the main areas to judge are Liberty's head, Liberty's midsection and the edge of the Shield at Liberty's waistline. Complete design detail includes a hair line over Liberty's forehead and leaves above. Liberty's midsection shows bold folds in the gown on a well detailed coin. Additionally a bold shield includes a raised rim on either side of a row of rivets. Notice the missing rivets and raised lines on the softly struck example. As you grade these quarters adjust for the quality of strike. Mint State coins when well struck are noted in the grade. In the higher circulated grades; Extremely Fine for example, the amount of wear surrounding typical areas of weakness is judged to determine grade. 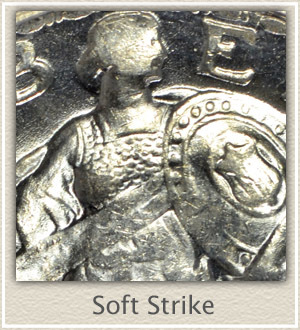 As a coin wears and begins to enter the Fine grade, softness of strike is not considered. In the Fine grade boldly or softly struck coins have worn to the same degree across the surface. A conservative approach when grading is best. Video index of how to grade coins. 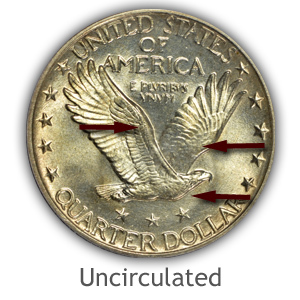 Denominations of US coins series covering cents to dollars are judged and graded using video, descriptions and images. Accurately determining the grade is an important step to finding how much your coins are worth. Standing Liberty quarters are valued by date | mintmark | and condition. Once finished with the grading process and assigning a grade, value is determined. Standing Liberty chart lists all dates and mints valued by grade. All US coin values. 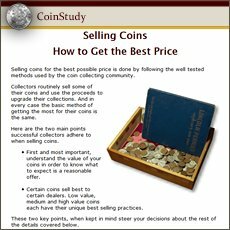 Compare and identify your coin to the image links leading to value charts. Important points to consider: Date | Mintmark | Condition are described and imaged for each series.